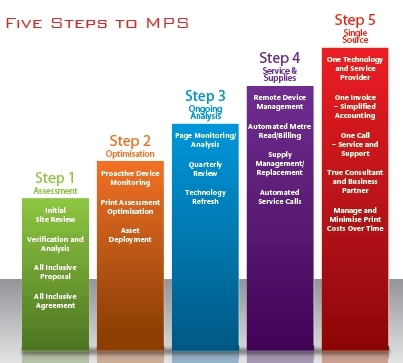 The Pettus MPS process begins with the initial conversation designed to identify your organizations current process for controlling the printing environment. We want to hear your main issues, pain points, and short term and long term goals to help construct the most efficient MPS solution to meet the ever-changing business needs of your company. Pettus MPS provides each organization with a free assessment of their current printing environment. Our cutting-edge print monitoring software provides us with key data such as page counts, ink and toner usage, service errors, and much more. In addition, we conduct a walk-through of the facility to identify areas for optimization. Once we obtain this information, we understand the true cost of printing a page in your organization. After the assessment is complete, Pettus MPS provides a full cost-analysis proposal based on your current printing environment. The proposal includes recommendations on a more efficient environment whether that includes new optimized equipment or simply re-arranging the current environment. On average, Pettus MPS provides our customers anywhere from 15% - 30% reduction in the total cost of document production. After reaching the agreement, Pettus MPS implements any new equipment if needed and the MPS process begins seamlessly without disrupting your organizations work processes. The ultimate goal of a managed print solution is to drive the cost of printing down across the entire organization. As time moves on and your business grows, your organizations printing needs will constantly be changing. With our program, an MPS specialist from Pettus conducts a formal review of your environment on a quarterly basis to analyze spend and look for ways to constantly optimize and drive down unnecessary costs.